Incontinence, also known as bladder leakage, is a life-altering condition. Surgery to treat incontinence can likewise be life-changing. Before you decide to pursue incontinence surgery for male bladder leakage, you’ll want to understand the stress incontinence surgical procedures, the incontinence implants available, the SUI surgery recovery process and what it will be like to live with a male sling or artificial urinary sphincter (AUS) device. First of all, you should meet with your urologist for a focused physical exam and discussion about treatment goals. Depending on the severity of your incontinence and medical history (for example, radiation therapy to treat prostate cancer) one or more implantable device may be indicated for your stress incontinence surgery. For less severe cases of stress incontinence, for example, for those men that experience occasional leakage when coughing, sneezing, or when lifting heavy objects and use only one or two pads a day, a urethral sling can be surgically implanted as a solution to treat incontinence. These slings provide support underneath the urethra in the form of a hammock, increasing outflow resistance and stopping the leakage. The urethra is the tube from the bladder that carries urine out of the body. Slings have become popular in the past several years because they provide passive relief of incontinence. Of note, an updated model of the sling (Boston Scientific AdVanceTM XP male sling) has just been released. Slings have become popular in the past several years because they provide passive relief of incontinence. For more severe cases of incontinence, the gold standard of surgical treatment for incontinence is the implantation of an artificial urinary sphincter (AUS). It involves the implantation of a small cuff around the urethra that replicates the closure mechanism of the muscles mentioned above. It is operated with a little pump that is hidden in the scrotum. A balloon roughly the size of a marble is connected to the cuff and the pump with tubes. When a patient uses the pump, the fluid in the cuff constricting the flow of urine is moved to the balloon and the cuff opens, allowing for urination. The mechanism reactivates itself automatically within one minute, stopping urine from leaving the body. The artificial urinary sphincter technology has been continuously improved over the past forty years. It has the highest level of patient satisfaction among incontinence treatments after prostate cancer therapy. Indeed, 92% of patients would undergo the sphincter implantation again1 as it allows them to regain the quality of life they had previously. After sling implant surgery, male urethral slings work immediately. Some patients are hypercontinent which means that the sling actually obstructs the outflow of urine. This usually will resolve in a matter of days or weeks and is a good predictive sign for future continence. Treatment consists of either a short-term catheter or self-catheterization. The implant procedure pain at the incisions and overall pain is quite limited and has not been reported to be a problem. Usually my patients leave the same day. (Sling placement is an outpatient surgery.) Within a few days my patients are back to their usual activity. I advise them not to squat for the first several weeks after the surgery to allow the sling to heal without loosening. Other activities of daily living such as walking, sitting, or light work-outs are of course possible. Pain at the incisions and overall pain is quite limited and has not been reported to be a problem. In the case of the artificial urinary sphincter (AUS) implantation, a six-week healing period should be observed after the incontinence surgery as this allows the cuff to heal around the urethra. During this healing period, the leakage of urine will continue as the device treating the incontinence isn’t activated at the time. Again, post-operative pain including incisional pain is limited and has not been a complaint of my patients. Patients who’ve had an AUS implant surgery to regain bladder control stay overnight for observation predominantly to continue antibiotic therapy. A Foley catheter that is placed during the surgery is usually continued overnight for patient comfort and to avoid urine retention. Incontinence surgery recovery is quick, and my patients are typically able to resume daily activities within a couple of days. The male urethral sling is a passive device which means that no interaction is necessary to void or go to the bathroom. Continence is achieved by compression of the urethra. 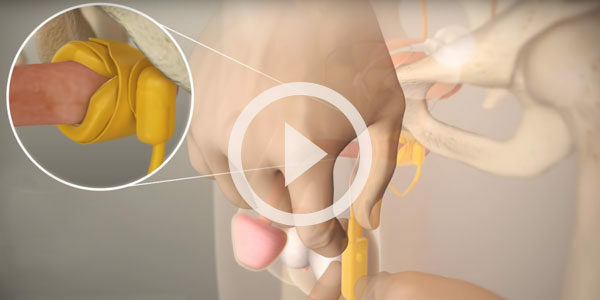 With the urethra compressed, the natural muscle closing capability that a patient has is supported. When a male sling patient needs to go to the bathroom, the closure muscle relaxes. His bladder during voiding provides increased pressure. Together, these actions are enough to override the compression of the sling. Slings may lose some of their effectiveness over time which may be due to decreased tissue tension and decrease of muscle mass during normal aging. If incontinence returns to a bothersome level the sling procedure can be repeated or the patient can get an artificial urinary sphincter. The artificial urinary sphincter is an active device and it is designed to mimic the function of the muscular closure. This means that a patient needs to interact with the device to open the cuff that is wrapped around the urethra in order to be able to go to the bathroom. This is done by a single squeeze of the pump hidden on the side of the scrotum. The location of the pump at the side of the scrotum is chosen to allow urination at a urinal. It is easily accessible in a standing position. The cuff of the AUS is designed to close automatically after a period of 60-90 seconds. It should be noted that the sphincter cuff is also engineered to leave a slight opening in the urethra so ‘emergency voiding’ through a closed cuff is usually possible. 1Litwiller SE, Kim KB, Fone PD, et al. Post-prostatectomy incontinence and the artificial urinary sphincter: a long-term study of patient satisfaction and criteria for success. J Urol. 1996 Dec;156(6):1975-80. 2 Sturm RM, Guralnick ML, Stone AR, et al. Comparison of clinical outcomes between “ideal” and “nonideal” transobturator male sling patients for treatment of post prostatectomy incontinence. Urol. 2014 May;83(5):1186-8.